Be Free’s works catched my attention the first time when I saw one of the Street Artist’s pieces near Federation Square in Melbourne. 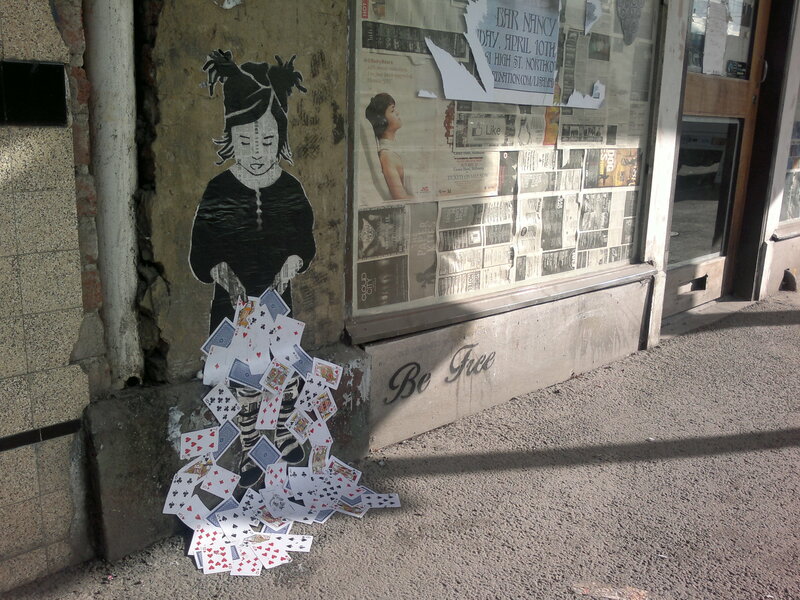 It showed a paste up of a girl playing cards, like most of his pieces. The motive (little girl), the colours (black/red), the location (negative space) and the different material (paper/cards) he uses are definitely an eye catcher. When I came across his work I felt like I know this girl, it just seems very familiar and on the other hand like from out of space as well. It was touching to see the little kid in the corner of an house entrance, but not in a sad way. It made me feel very happy. When I continued my trip to Brunswick and Smith Street I found more pieces and after a little research online I found this very interesting interview and video.